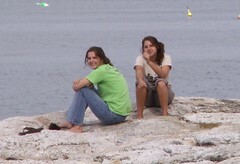 The final Audubon Camp in Maine session for the 2010 season was titled ‘Maine Seabird Biology and Conservation’. This service learning program was a collaborative venture with Road Scholar (formerly Elderhostel). It represents the strengths of combining the on the ground seabird management of Project Puffin with the power of 32 people — motivated to not only learn about seabird biology, but participate in direct conservation actions. The group assembled on Hog Island on Sunday, Sept. 19 for the five day program. This was the second Road Scholar program at Hog Island this summer. Like the late May-early June program which focused on censusing nesting seabirds, this program connected eager volunteers with service projects that required many helping hands. Like other sessions this summer, this group represented every corner of the country — 16 states in total. Ages ranged from 52-75 and included a great diversity of semi and retired professionals. All actively participated in the program. In addition to the registered participants, eight members of FOHI (Friends of Hog Island) volunteered their time to assist in the kitchen and join in on the field projects. Cutting overgrown vegetation from the artificial puffin burrows that once housed Newfoundland puffin chicks and digging new entrances to adapt them for Leach’s storm-petrel nesting. Soon fifty burrows were restored and ready for storm-petrels to nest next summer. Pulling abandoned lobster traps from seabird nesting habitat. Past storms had tossed the traps onto the island creating danger for nesting seabirds. Two black guillemots and a laughing gull were found entangled in the traps, tragic reminders about the issue of entanglement. By the end of the 2nd day, more than 50 lobster traps were pulled out of the nesting habitat and several hundred abandoned buoys and other plastics were collected. Removing vegetation from the Allan D. Cruickshank sanctuary sign, repainting the letters and re-installing it with new posts. Clearing vegetation from overgrown Common and Roseate Tern habitat and installing outdoor carpet mats to serve as weed barriers, thus creating new habitat for these threatened seabirds. About 200 square meters of new habitat resulted. The 32 participants donated more than 200 hours of work to help the Egg Rock seabirds. The equipment to cut the vegetation and purchase the weed barrier was provided by a grant from NAWCA (North American Wetland Conservation Act) administered by the U.S. Fish and wildlife Service and LL Bean. When advance winds from Hurricane Igor made landings unsuitable at Egg Rock for the remainder of the week, the group happily turned their service inclinations to entering seabird data on Project Puffin computers, cutting invasive barberry shrubs and scraping and painting window trim on Hog Island buildings! In addition to the service projects, the group found time to visit many local birding hotspots and hear lectures on backyard landscaping for birds from Stephen Kress and bird migration from Scott Wiedensaul. Volunteer Eric Eichorn helped put up the infamous tidestick. Have you ever wondered what goes on behind the scenes at Hog Island before you arrive for your camp session? Well, this should give you an idea. A group of dedicated alumni, members of the Friends of Hog Island (FOHI), to which all “graduating” program participants automatically belong, gathers a week before the first ornithology session to help the staff open the camp. They have a very busy week: cleaning, scraping, painting, gardening, building, clearing and building trails, and putting in the tide gauge. And of course there are the rewards: eating Janii’s gourmet feasts, greeting the visiting groups of American Birding Association members on their way out for a boat trip to see the puffins on Eastern Egg Rock, swimming off the dock with Ayla, a boat trip and birding with Art Borror, evening slide presentations for reminiscing in the new chairs in the Fish House, and even a gallery opening in the Bridge! We just thought you might all like to hear more about your wonderful Island! A group of dedicated alumni, members of the Friends of Hog Island (FOHI) — to which all “graduating” program participants automatically belong — gathers a week before the first ornithology session to help the staff open the camp. We’re looking forward to seeing “Friends of Hog Island” volunteers, new and not-so-new, at our upcoming “Work and Learn” session June 12-17! We’ve got a long list of projects to tackle as we prepare to help Hog Island wake from its winter slumber, in anticipation of our best summer yet! 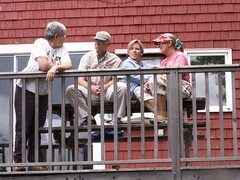 Seth Benz tells me registrations are running ahead of many previous years, so we think 2005’s going to be a great year for the Audubon Camp in Maine. It’s time to get ready! Naturally, it won’t all be work. Tom Schaefer’s been busy researching camp history and he’s got some fascinating Hog Island anecdotes and stories to tell. (Does anyone know the real reason why bird instructor Roger Tory Peterson only lasted a year at the Audubon Camp?) This winter, I’ve been scooping up some early Hog Island historical finds on ebay myself, and I’ll bring them along, too. Weather permitting, we’ll take a half-day boat trip out to Eastern Egg Rock, too, after our regular early morning bird walks. We’re dedicating our 2005 FOHI “Work and Learn” week to our dear friend, the late Bart Cadbury. We’ll honor and remember him with our fellowship, our stories, and our fond memories, as we celebrate his continuing influence over this island. We’ll see you on the dock!